Hosta ‘Undulata Univittata’ is a very common hosta, and it is always one of the first to emerge in spring. It has wavy leaves with curved tips and a very thin substance that makes them a real attraction for slugs. 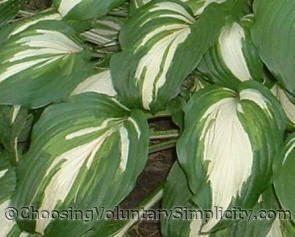 It is interesting to see how the leaves on one hosta will not all look the same and will have many different markings. Undulata Univittata is listed as being sterile, but it does sometimes form seed pods, and the seeds are viable. I have one solid dark green seedling grown from seeds from Undulata Univittata that has a few leaves with the colors reversed… leaves with dark green centers and white borders. More of this young seedling’s leaves are getting the variegated coloration every year, so it will be interesting to see how it develops. This is a pretty hosta but mine is just full of small holes and it looks A-W-F-U-L!! I don’t know what the small holes are but I don’t think it is bird damage or anything like that. It’s too bad because this hosta is beautiful when it looks like yours. Mine is anything but. Hayley, I would guess that those small holes are made by slugs. 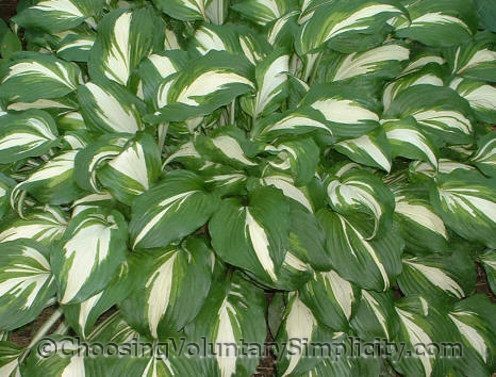 The Undulata Univittata hosta has very thin leaves… just like slugs love… and they can make it look terrible in just a few days. Some people put out little trays of beer or use copper or other home-type remedies to catch and kill or repel the slugs, but if you have a lot of hostas like I do, those ideas don’t work very well. I keep slugs under control with a natural, non-poisonous slug and snail bait that is actually iron phosphate. 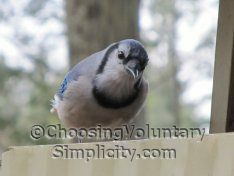 It gets rid of slugs but it won’t hurt frogs or birds if they eat it, and it’s harmless to children or pets. The slug bait comes in little pellets that are spread around the hosta. It works really well although it is quite expensive. There are several brands available… any garden center should have them. This blog post inspired me to try planting a few seeds from the pods of my undulata univittata and I came up with 2 dark green seedlings. They are now 7 months old and one of them has a little bit of white around the edge of 3 of its leaves. The other one is just green. I have had such fun seeing these hostas develop. I can’t wait to plant more hosta seeds this winter. Thanks for sharing your method and encouragement. Thank you very much for identifying my ole timey hostas for me (Lancifolia and the 2 undulatas). I know the names of most of my other hostas but never knew what my ole timey ones were! I inherited my ole timey’s from my dad but bought all the rest. Someone needs to write a book – Hostas and the art of motorcycle maintenance!